You are here: Home / breakfast / Coffee Smoothie – Dairy Free and Sugar Free! 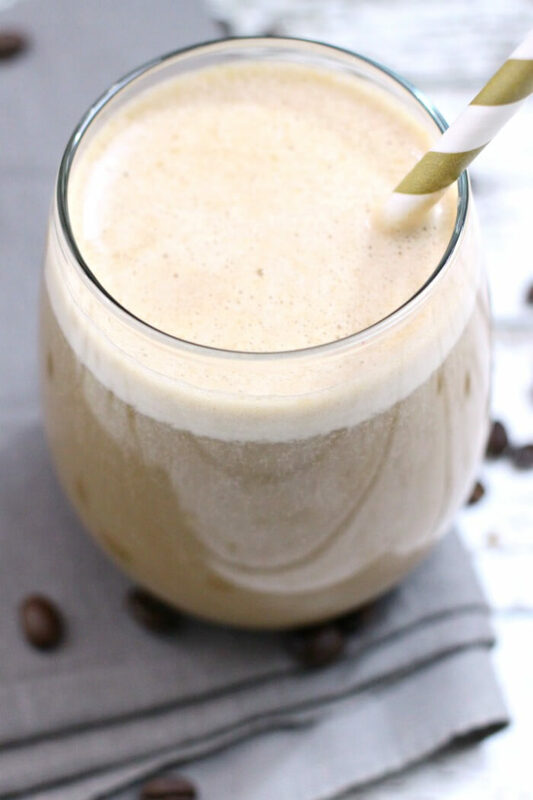 If you’re in the mood for a coffee smoothie, but don’t want to blow your diet out of the water, this easy coffee smoothie recipe is just the thing for you! 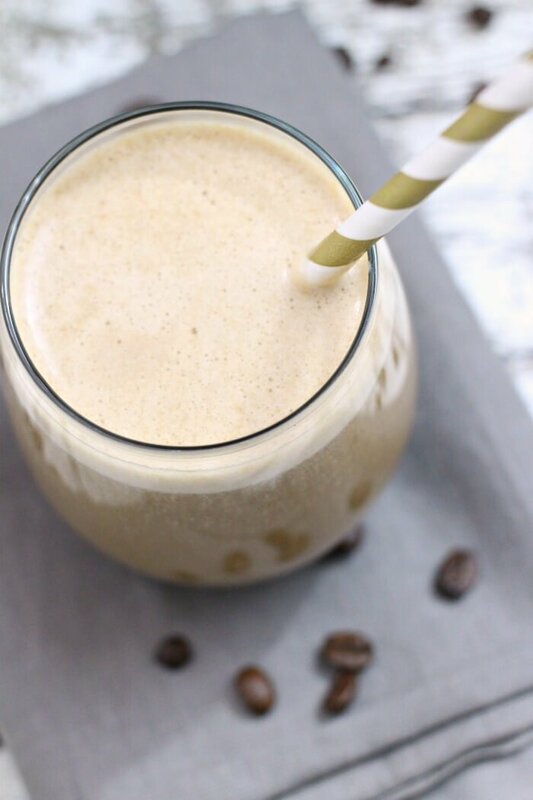 Our banana coffee smoothie is ridiculously easy to make and super delicious. I was worried the smoothie would have an overwhelming banana flavor, but not at all! I’m not much of an eater in the morning, so I’ve been making this healthy coffee smoothie for breakfast. It’s the perfect pick me up! If you’re looking for a non-coffee smoothie, check out our Strawberry Peach Smoothie, or this Mixed Berry Smoothie made with coconut milk! This recipe is a partnered effort with Dannon – all content and opinion belongs exclusively to Mama Loves Food. Packed with nutritious AND delicious ingredients, Dannon snacks and drinks are the perfect energizer to get you moving! Most mornings I don’t wake up hungry, but I know if I skip breakfast I’ll be absolutely miserable by lunch time. So, I usually grab a banana and a cup of black coffee. It works, but sometimes I miss my sweet creamy coffee. Recently the only banana left was super ripe. And while I knew I should eat it, the thought of mushy banana for breakfast wasn’t cutting it. So, I did what any sane person would do (hahaha) – I threw it in my coffee. I was prepared to be completely grossed out by banana coffee, but as it turns out, it really didn’t taste like banana! Instead it tasted like a yummy creamy coffee treat! The next morning I made it again, but this time with some almond milk – oh my goodness, it was even better! Then, recently I had some soaked chia seeds in the fridge waiting to become pudding, so a scoop of those went in too. This coffee smoothie has gone from a desperate attempt to avoid eating mushy bananas to one of my favorite morning treats! 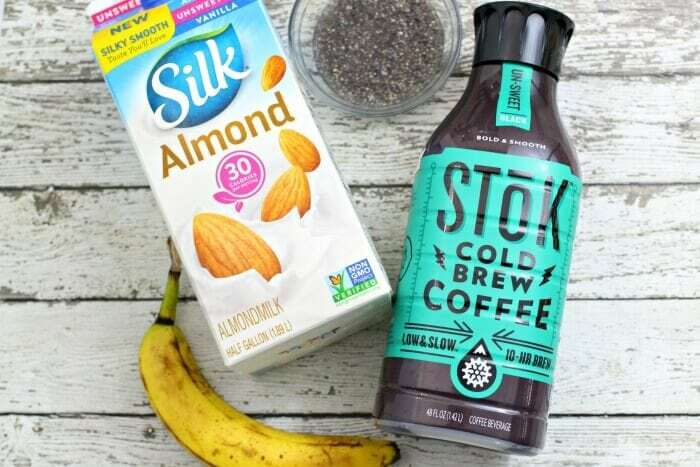 For the coffee in our banana smoothie recipe, we used STōK™ Cold Brew Coffee. It’s so convenient because I can store the bottle in the fridge and have it all ready to pour into the blender whenever I want my smoothie. The cold brew process gives it a wonderfully bold taste that works perfectly. 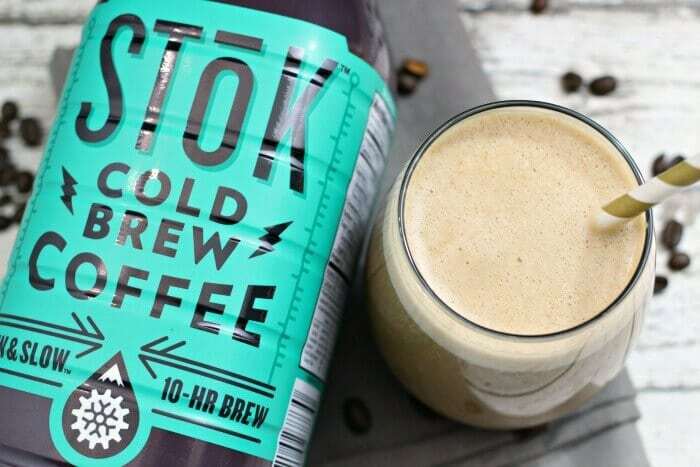 STōK™ Cold Brew Coffee comes in multiple flavors and is steeped at a lower temperature for ten hours. SToK coffee brews their Arabica-based blend using a higher ratio of coffee beans to water than typical hot brewing. This process brings out every drop of smooth, bold, delicious cold coffee. Take a sip — great coffee speaks for itself. We also used unsweetened Silk® Almond Milk to make our coffee banana smoothie creamy and delicious without adding lots of empty calories. I love that you can get it sweetened or unsweetened. Chocolate too! With a mildly nutty taste and a calorie count that isn’t nutty at all, Silk® Almond Milk is perfectly poised to become your coffee’s new best friend. Plus it can be a smart swap for milk in recipes or shakes. Every delicious glass has absolutely no cholesterol and no saturated fat. That’s what we call the power of plant-based nutrition! Word of warning about adding chia seeds – I suggest soaking them overnight (just throw them in a mason jar with water, shake a few times, then refrigerate). I also do NOT suggest using them unless you have a high powered blender. Your run of the mill kitchen blender will not blend chia seeds smooth and you’ll end up with a gritty coffee smoothie. Gross. This smoothie is delicious without the chia seeds, so if you don’t have a super mega blender, don’t worry. Just skip the seeds. Use flavored coffee – how about a chocolate, vanilla, or hazelnut coffee? Oh my goodness, hazelnut coffee smoothie sounds amazing. Add a scoop of peanut butter or peanut butter powder. Better yet, chocolate flavored coffee with peanut butter powder! Oh my, it’s like a peanut butter cup for breakfast. Don’t have flavored coffee? Then try a small scoop of cocoa powder! Mocha coffee smoothie, here we come! Try flavored almond milk – almond milk comes in a variety of flavors these days! Cinnamon and nutmeg would make delicious additions as well. Put some in the smoothie, and maybe a little on top for flare. Want to make it even more filling? Toss in a scoop of protein powder. 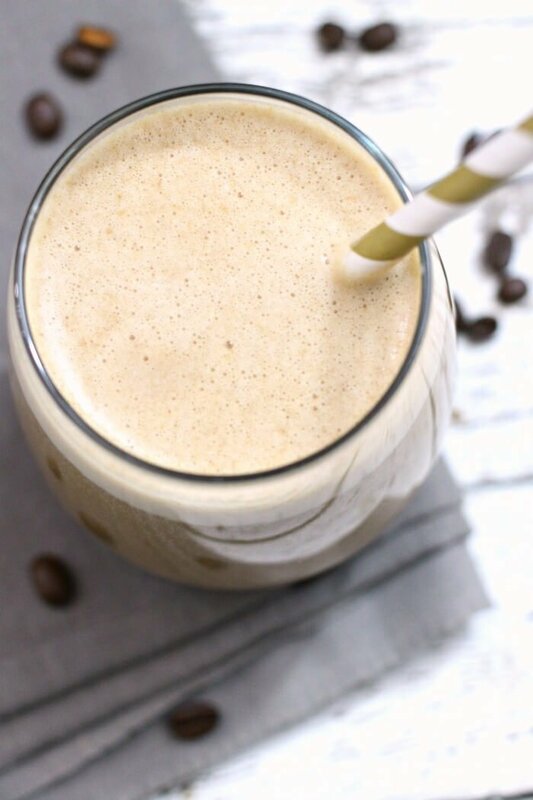 I bet vanilla protein powder would taste delicious in this banana coffee smoothie! Bulletproof Coffee – Butter and coconut oil in coffee only sounds weird until you taste it. 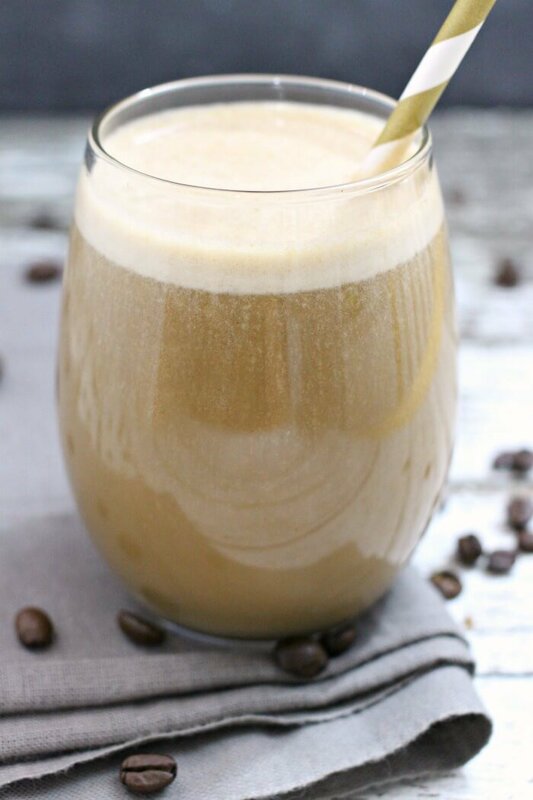 One sip of this nutty and delicious bulletproof coffee will have you asking for more more more! 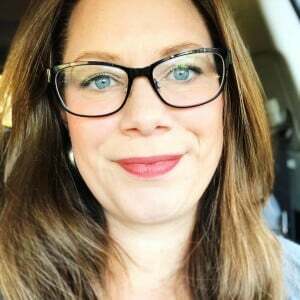 Peppermint mocha coffee – I don’t care if it’s the middle of summer, there is no wrong time for a peppermint mocha coffee. 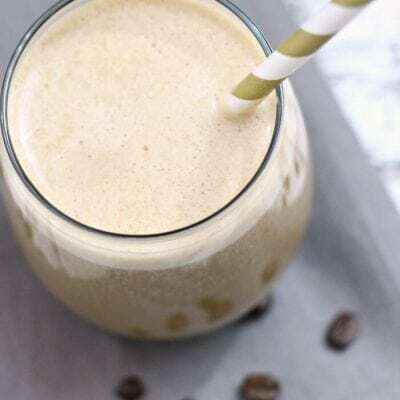 Pumpkin Spice Frozen Coffee – Another coffee drink that is delicious year round. Calendar be damned, we want our pumpkin spice! Kahlua Jello Shots – These are not your college jello shots! Creamy and decadent with just enough Kahlua to make you feel darn good. Check out the Perfect Pick Me Up website for my recipe and others! Add banana to blender. The more ripe your banana, the sweeter your smoothie will turn out. Just like when you’re making banana bread. Don’t be afraid of the dark spots. Add 6 ounces of strong black coffee. Add 6 ounces of almond milk. We used vanilla unsweetened. Add 1 tablespoon of chia seeds. They’re best if soaked overnight first. 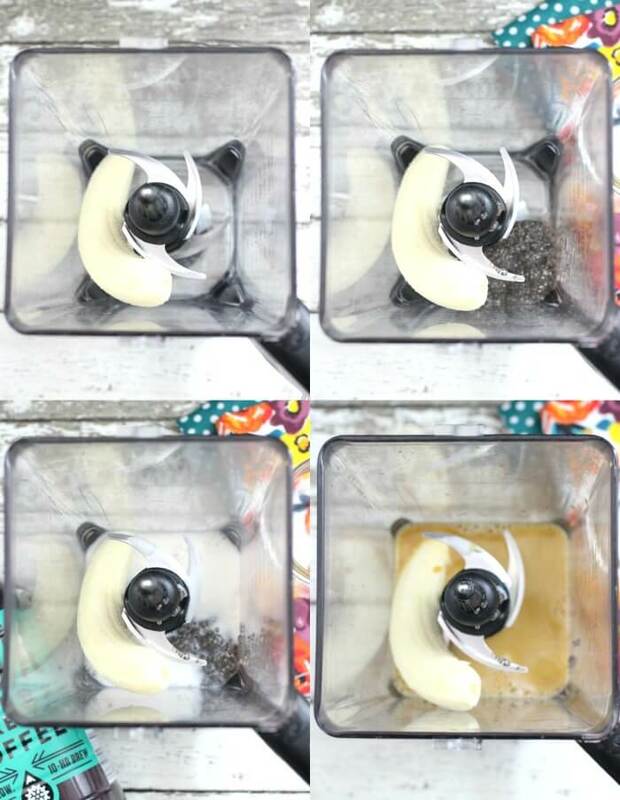 If you do not own a high powered blender, you’ll want to skip this step. Gritty coffee is no fun. Don’t worry, it’s still super delicious without the chia! Blend until smooth. If you’re using chia seeds, you’ll want to scrape the sides a few times to make sure everything is well blended. Great tip about the chia seeds. I have a Ninja blender and it really struggles to break them down. 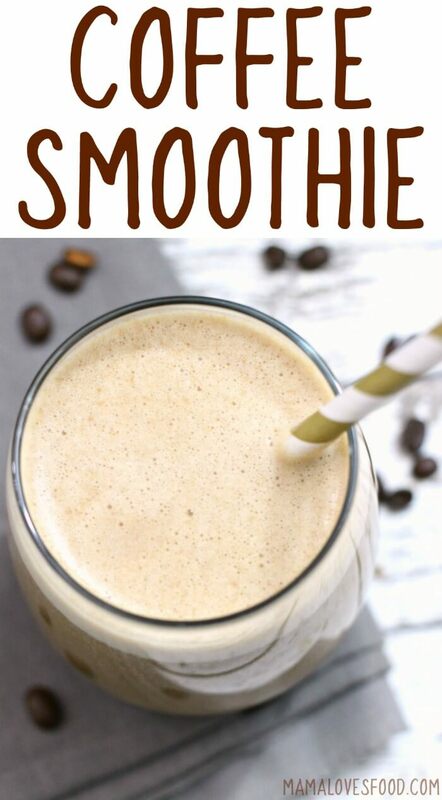 This coffee smoothie recipe sounds delish! Ooh yum, I NEED this in my life!! I am never hungry in the morning either, well I am but I just can’t fathom eating until after my coffee. Banana in the coffee though…genius!! I think this would help power me though until the afternoon slump hits! When I look at the recipe card, the first instruction says to “Hop over here to see the full directions,” but when I click the link I get your error page. Can you please look at this to see if it can be fixed. Thanks! What is the measurement for a scoop when referring to the coca powder and peanut butter?